Turbo offers this attractive looking swimsuit which provides a comfortable fit. The Coral Reefs costume comes fully lined with flat locked seams. The material allows you plenty of movement whilst in the water. Turbo strives to offer long lasting chlorine resistance within their range. 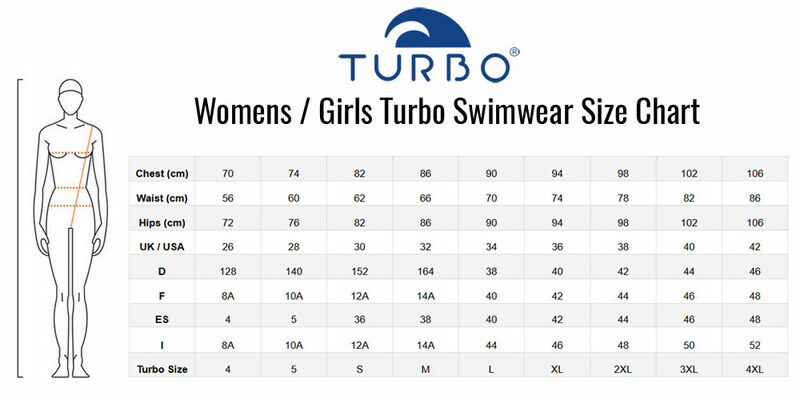 Turbo was established over fifty years ago and is now considered to be one of the leading swimwear brands. Turbo swimwear products are chosen by thousands of competitive swimmers and amateur swimmers all over the world. Turbo offers this attractive looking swimsuit which provides a comfortable fit. The Turbo Coral Reefs costume comes fully lined with flat locked seams. The material allows you plenty of movement whilst in the water. Turbo strives to offer long lasting chlorine resistance within their range. The anti-chlorine fabric is pproven to withhold harsh chlorine conditions. The Turbo Coral Reefs Costume is ideal for training, in the pool and open water.